Since roughly the time we came down from the trees, humans have been worried about how other people see them - in short, how well groomed we are. And while the standards we been holding each other to in regards to hair care and general hygiene have fluctuated over the ages, it seems that the desire men have to scrape the beard off is timeless. Perhaps it has to do with perceived status - by taking the time to trim your beard you showed everyone who saw you that you had an excess off time; which presumably translated into having an excess of resources in general. And since fashions spread quickly, soon everyone was wanting to take their beard off - creating a market for clam shells, finely made obsidian blades and some time later metal blades made expressly for dragging across downy cheeks. 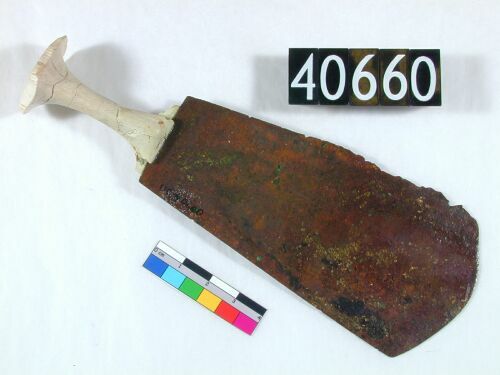 A more utilitarian bronze razor (and nail trimmer) from the Hallstatt culture. How about a Scandivian bronze razor from the 2 century BC - the depicted ship on it a clear predecessor to the Viking longships? As metallurgy progressed we got the steel razors, then the cut throat razor and finally the modern safety razor... but I still can't help to wonder what it would be to pick up an bronze instrument like one of these to get the stubble of my face. I wonder if anyone sells working replicas... ? This post contains pictures from Wikipedia and other online sources. I believe someone does. IIRC. How do historians know that those were used for shaving though? I've always been curious about that, but have taken them at their word. I'll pass on the "sharp" edge of a bronze razor. Flint would make a good shaving edge. Hans I wonder if not a predecessor of a long ship, could it be a stylized long ship? Or it could be a reminder... "Don't forget to put this on the ship.". I found references to using obsidian blades for shaving on Easter Island... would be scary sharp. As for these being meant for shaving... looking at the shape there is little else they can have been for, added to the fact that they have only been found alongside buried males. So I guess I'll take the experts words for it. I think the mead required for anaesthetic would be more fun than the actual shave. But I bet they also had a much different idea of what a close shave was also. I bet a BBS wasn't even on their radar screen. (08-23-2012, 09:44 AM)WegianWarrior Wrote: I found references to using obsidian blades for shaving on Easter Island... would be scary sharp. There are a few videos on YouTube of a guy using obsidian to shave. I can't search YouTube at the moment, but it's pretty easy to find them. It does seem that the shards are really sharp. I'm glad the razor progressed beyond those razors. Thanks for sharing. (08-23-2012, 10:40 AM)Howler Wrote: I'm glad the razor progressed beyond those razors. Thanks for sharing. + infinity Sheesh, can you imagine shaving with some of those things, everyday? !